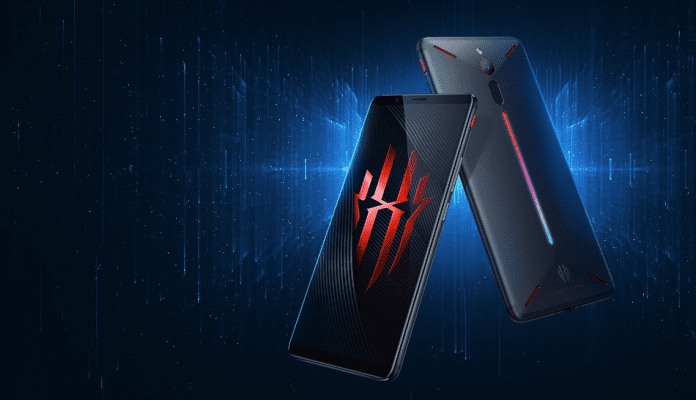 Nubia Mobile, a subsidiary of ZTE, has now officially launched its first gaming smartphone called the “Red Magic” after it made the announcement last week. Designed with gaming in mind, the Red Magic has a very aggressive design, complete with slim bezels around the edges and a black anodized aluminum unibody chassis. There is a vertical RGB strip that runs down the rear of the phone below the fingerprint scanner that can be customized to “mimic your gaming persona”. The strip can display 16 million different colors and comes with four different lighting effects to customize your look. The smartphone comes with a 5.99-inch Full HD+ (1080×2160 pixels) LTPS TFT display with an 18:9 aspect ratio and 1500:1 contrast ratio. The handset is powered by last year’s Qualcomm Snapdragon 835 processor, and comes with 6GB or 8GB of RAM, 64GB or 128GB of UFS2.1 internal storage, and a 3,800mAh battery. It also has built-in DAC and DTS amplifier. Nubia also touts that the Red Magic has an “all-new air convection cooling system that dissipates heat effectively across its diamond-cut design without compromising on performance,” apart from three-layer graphite lamination technology that regulates the device’s temperature to remain at optimal levels. The Nubia Red Magic sports a 24MP rear camera with an ISOCELL image sensor, an f/1.7 aperture, and a 6-piece motor driven lens. On the front, it has an 8MP camera with a BSI sensor, f/2.0 aperture, 76-degree wide-angle lens, and a 3-piece lens. On the connectivity front, it includes Wi-Fi, GPS, Bluetooth, USB OTG, 3G and 4G. The Nubia Red Magic comes with a GameBoost mode, which frees up memory-intensive resources and delivers higher frame rates. It is capable of recording 4K videos at 30fps (frames per second). The dual-SIM (Nano) Nubia Red Magic runs the Nubia Red Magic OS that’s based on Android 8.1 Oreo. The handset will be made exclusively available through IndieGogo on April 26 with a starting price of $399. On the other hand, Chinese users can purchase the 6GB+64GB model for 2,499 yuan, and the 8GB+128GB model for 2,999 yuan.